Over the last three years, we have worked tirelessly as a community to improve the reader experience on HubPages and raise our standards of quality. Hubbers have worked to better their Hubs, and we have implemented programs and features like the Quality Assessment Process, Boot Camp, Style Tips, and the Apprenticeship Program. We can see from quality metrics that your efforts and these programs are making a difference in reader satisfaction. But—we can still do more! 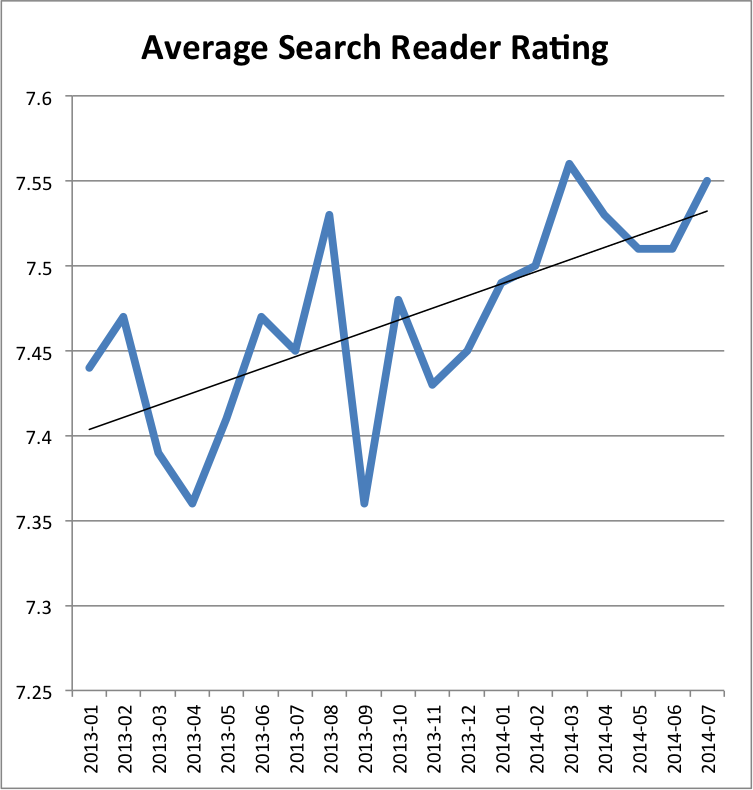 We measure reader satisfaction by asking random search visitors: “How good is this article?”. They rate their experience on a 1-10 scale and we aggregate that data over time. The next step in our quest to satisfy readers is a new professional (and free!) editing service that we are calling HubPro! In April, we piloted a version of this service and worked with a small number of Hubbers to learn more about how we could successfully bring editing to HubPages. In addition to collecting invaluable feedback from our pilot testers, we’ve been fine tuning the tools and process, and we are so excited to open up HubPro to more members of the community. We have hired an extremely talented team of editors, trained specifically for HubPages, that will partner with you to take your Hubs to the next level. Why are we Editing Hubs? We want HubPages to be the premier place for readers to find information on a variety of topics. Plus, most professional writers benefit from editors, and we want to extend this service to the writers on HubPages. Additionally, many Hubbers have asked for an editing feature, and this is our first step. In order to compete and succeed in the current competitive landscape, most Hubs need improvements. Even the most successful Hubs can benefit from revisions, and we recognize that not all Hubbers have the time to frequently edit. There is a common misconception: if it ain’t broke, don’t fix it. This does not apply to online content and is risky advice. In fact, Hubs that are receiving traffic are the ones that should be improved and updated more frequently to maintain their traffic. Traffic will fluctuate whether Hubs are edited or not, but we strongly believe that improving and updating Hubs will have a positive effect on reader satisfaction, which is highly correlated to the amount of traffic a Hub receives. What did we Learn From the Pilot? Edited Hubs in the pilot program have had a positive effect on reader satisfaction and significant increases in traffic—the median edited Hub has seen search traffic grow around 17%! In the short run there are clear gains, but more importantly, we are investing for the long term to boost the quality of Hubs, improve the credibility of our brand, and ensure the health of the site. Ultimately, we want to provide the best experience for as many readers as possible, and starting with Hubs that receive the highest traffic is a logical first step in achieving this goal. In the beta, our editors will only be editing a small percentage of Hubs, but this is just the beginning. We have big plans for editing in the future— stay tuned! If you are one of the lucky few Hubbers selected to participate in the HubPro beta, you will receive an email with more information. Our hope is that all Hubbers will participate in the program, however, if you would like to opt out, go to My Account > Profile. If you choose to opt out, you cannot opt back in to the program for 60 days. We will begin editing Hubs in one week, and we will be publishing a FAQ soon with more detailed information. Editing Hubs is a huge strategic move for HubPages, blending user-generated content with professional editing services. Thank you for being a part of this monumental effort! UPDATE (8.4.2014): We have published a FAQ and it is available here. Hello Hubbers, I have a quick announcement this afternoon. In order to promote quality content on HubPages and ensure the best reader experience possible, we’re changing the way broken links will be handled in Hubs. When Hubs contain broken links, those links will now display with a line through them, and when clicked on, a warning will appear notifying the reader that the link is no longer functioning. We’ve decided to implement these changes in accordance with Google’s Webmaster Guidelines which state that quality sites should have few broken links. Along with providing more transparency to readers, the new broken link warnings will have the added benefit of making broken links invisible to Google. Hubbers will still receive a warning when links become broken, and as always, it’s a good idea to fix or delete any broken links asap. These warnings will only apply to broken links that appear within the body of the Hub. Links in comments will not be affected. Twitter can be an excellent platform for growing your online brand, establishing yourself as an authority, and of course, promoting your Hubs. But before you can reach and influence lots of people on Twitter, you’ll need followers who actually see and engage with your content. There’s a lot of bad advice on the internet about how to grow your Twitter followers. Some articles suggest following people indiscriminately, even when you have nothing in common. Others advise Retweeting everything you come across or Tweeting your own Hubs over and over. Some even advocate engaging in hashtag spam (the overuse of hashtags and/or the use of unrelated hashtags in your Tweets). But the truth is, those practices will likely drive away more followers than they attract, and the followers they do attract are more likely to be other selfish Twitter users who are also looking to grow their audience at any cost. Engage with other users… but not indiscriminately! Follow organizations and people you care about, comment on their posts, and Retweet things that you genuinely think your followers will enjoy. Following lots of people you have nothing in common with is probably not going to garner the engagement you want. But if you like to write gardening Hubs, following a gardening site, commenting, and occasionally Retweeting is likely to be rewarding. Share often… but don’t spam your followers! Tweeting your own Hubs over and over will only drive people away. Your Tweets should be a mix of Retweets from the people you follow, your own thoughts and comments, and your Hubs that you think your followers will like. It’s a good idea to Tweet several times a day every day in order to keep your audience interested. Drop names. Mention the people, brands, and organizations you tweet about. For example, if you want to Tweet about HubPages, use @HubPagesDotCom to tag us in your post. If we see it, we may Retweet it! Use hashtags… but don’t engage in hashtag spam. Only include 1-3 truly relevant hashtags that actually reflect what your post is about. Care about the community. This one is the most important. You want to cultivate a community of like-minded people to engage and share with regularly, not a herd of followers to exploit for the sole purpose of propagating your Hubs. If your heart is in the right place, the rest will come naturally. Use interesting, eye-catching photos. Most of the sharing on Twitter involves photos. Your Hub’s first photo should be as interesting and eye-catching as possible. The better the photo, the more people will want to share it on Twitter. Write on subjects that appeal to a broad audience in a variety of situations. Your Hub on how to replace the brake pads on a 1998 Honda Accord may be a rockstar with search traffic, but it’s only useful and interesting to people with a 1998 Honda Accord who want or need to change their own brake pads (which does not apply to most Twitter users). You should totally still write that Hub, but you may also want to write one about the Top 10 Personality Traits of Honda Drivers, which will be perfect for Twitter. Tweetable content has heart and meaning. A positive message is much more likely to be shared on Twitter, especially if it makes people feel good about life and themselves. Write about good things, amazing things, and heartwarming things that have inspired you, and they will be more likely to inspire your readers to Tweet. In other words, make sure your Top 10 Personality Traits of Honda Drivers are good traits (Honda drivers are economical but not cheap, Honda drivers are family-oriented, Honda drivers are dependable, etc).